With proper care, you can extend the life of your plastic products like Sign Holders and Poster Holders indefinitely. Keep them clean and you’ll get a great return on your investment. But watch out because some common cleansers and methods you’d THINK would work can actually do more harm than good. So save the Windex for windows and try the following instead. Start with the basics. A simple mix of mild soap or detergent with warm water and a light touch with a soft cloth is very effective. Give your acrylic a thorough rinse and dry it by blotting with a damp cloth or chamois to avoid residual spots and marks that can interfere with the clear visual acuity. Be sure to avoid those window cleaning sprays, abrasives, and/or kitchen cleaners. 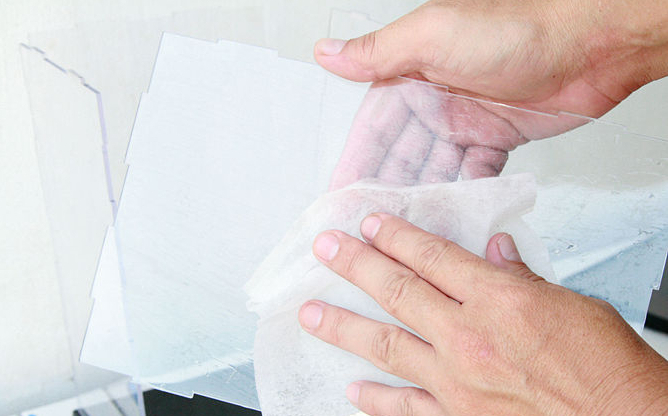 The composition of acrylic sheet is more sensitive than you might realize no matter how tough the sheet itself…and seemingly harmless household and industrial strength cleansers can be damaging. Other solvents like acetone, alcohol, carbon tetrachloride, and lacquer thinner can also leave scratches and weaken the sheet’s structure, causing it to crack. This is where specially formulated plastic polishes can enhance surface gloss. Novus Plastic Polishes, for example, contain no harsh chemicals or abrasives and leave a lustrous shine. 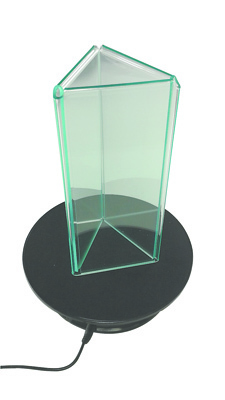 Applied with a Polish Mate Polishing Cloth, your acrylic POP Displays will maintain a well-buffed, crystal clear appearance…and so will the promotional materials they’re designed to showcase. No fading, no hazy reflection. Non-abrasive Polish Mate Polishing Cloths also eliminate dust-attracting static. Of course, scratches can still occur no matter how diligent your level of care. In that event, it’s time to break out the Novus 2 Fine Scratch Remover…or for heavier abrasions, Novus 3 Heavy Scratch Remover. These acrylic-specific solutions contain restorative properties that are extremely effective at scratch and abrasion removal. When it comes to projecting a professional image and presentation, it’s important to keep your acrylic display products clean and polished. With a simple, careful, and consistent cleaning approach and the right polishes, scratch removers, and polishing cloths, your acrylic display products can keep their like-new appearance – devoid of haze, discoloration, fading, fingerprints, residue, and scratch marks. 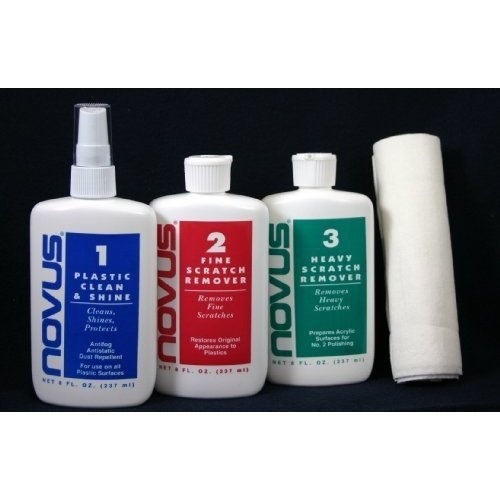 You can order Novus products at http://www.plasticproductsmfg.com/Browse-Catalog/Novus-Plastic-Polish-Cleaner/ and if you have questions, just ask a PPM Customer Service Specialist. We’ll show you how to make your next campaign look just as amazing as the last one! Finding effective new ways to draw customer attention with Sign Holders, Table Tents, and POP Displays just hit new heights at Plastic Products Mfg (PPM). Long known for innovative new products and approaches, PPM’s introduction of the industry’s first Rotating Turntable Display makes promotional campaigns stand taller and deliver more eye-catching appeal through movement and 360-degree exposure. 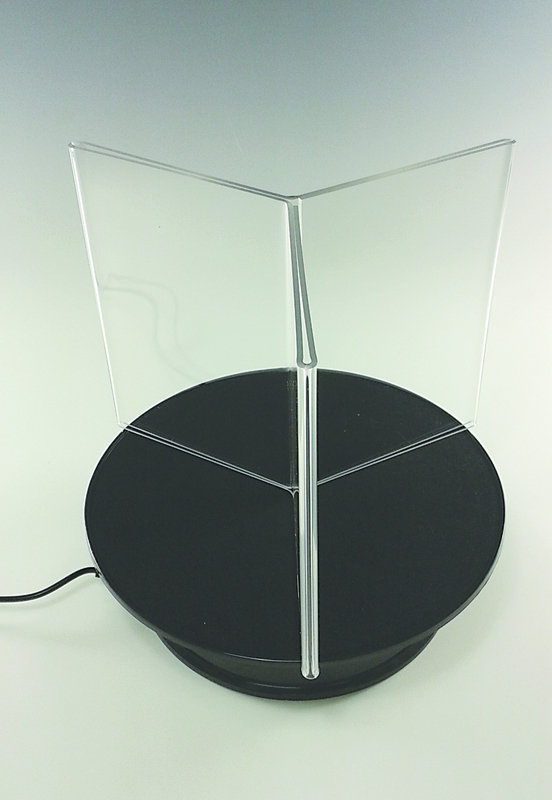 It’s no secret: when you put your top product or line on a rotating pedestal, customers are instantly drawn. It works at car dealerships, and retail countertop POP Displays with watches and fine jewelry. Yet no other manufacturer/supplier of promotional display products has captured that concept until now. PPM’s revolutionary new Rotating Turntable Display lends that captivating movement, synchronicity, and height to retail and service-oriented promotions more effectively than ever. Both electric and battery powered, this unique rotating display brings new excitement to in-store campaigns. In the restaurant/bar industry, Turntable Displays provide an especially effective way to run promotions when combined with PPM Style G Sign Holders and Table Tents. With this Triple-Sided Vertical Sign Holder perched on a Rotating Turntable, multiple panels are presented for easy viewing every few seconds. Staff can easily interrupt the motion temporarily to switch promotional literature in this convenient, top-loading model, then resume rotation immediately. It really gives your establishment a cutting-edge look while showing your hottest sale items. Also effective in similar venues, Style Q four-sided Restaurant Sign Holders used in conjunction with Rotating Turntable Displays deliver an attention-grabbing dimension in high foot traffic areas. Putting this symmetrical design in rotation can also deliver results in your campaigns on countertops and desktops…solid results that just might surprise you. Another advantage to PPM’s Rotating Turntable Display? The low price tag! Exceptional R&D behind the scenes has resulted in a turntable that’s dependable and works hard – only in a design that’s budget friendly. Turntable Displays can also be customized in ways where the only limit is the imagination. PPM put that versatility to practical use in a custom Gift Card Display Holder developed for Massage Envy Spas. It’s exemplifies the direct one-on-one opportunities available…ways to maximize customer loyalty, retention, and upsells while they’re right there in front of you. As a leading player in a thriving industry, the forward thinking applied at Massage Envy can be easily duplicated in other service capacities. Similarly, options for successful campaigns can be found using multi-sided Sign Holders with rotation on a Turntable Display. Show six sides with Style D6; eight using Style D8. Whichever fits your needs best, promotional literature and the latest advertisements will get more attention on a Rotating Turntable Display. 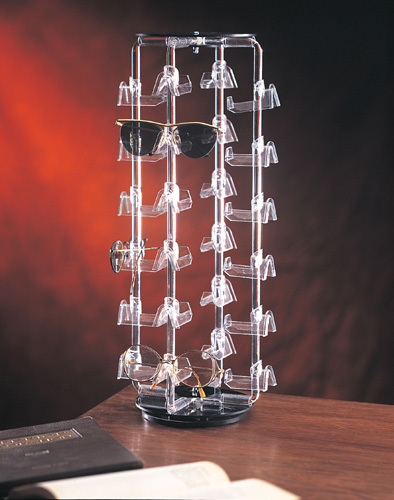 Consider it a highly cost-effective return on your POP Display investment. PPM Customer Service Specialists can help you put bold new Rotating Turntable Displays to work for you right away. Or keep an eye out for new developments at www.plasticproductsmfg.com. Hands down, there’s never been a better way to put a positive “spin” on your business!